OK, this is the LAST of the cherries, I promise!!! This project just got away from me and took on a life of it’s own, but I’m done now — out of cherry paper — LOL!!! This never started as a gift set, but just kind of evolved asI couldn’t quit playing with the cherry paper (Summer Picnic by SU). 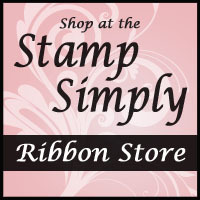 The stamp used is from Tart and Tangy by SU. The card, which has a pocket inside to hold a recipe, was made about a month ago for a swap and details, with template, can be seen here. The recipe box was uploaded a few days ago and can be seen, with template, here. The gift bag is an 8 x 10 handled bag from Wal-Mart, just decorated to match the above. The jar is cookie mix decorated with my last few inches of red ribbon and the last of my cherry DP. Typically when I do a jar, I like to wrap the paper entirely around the jar. Well, even though my paper was 12″, it wouldn’t quite make it around this jar — bummer — short by about 1/4″. So it doesn’t wrap all the way around — I just made it to go around 1/2 the jar and taped it on well with my ever so trusty Carpet Tape, seen here. That’s it for now — no more cherries!!!! I hope to do and upload another project later today. Thank you so much for stopping in! What a gorgeous gift set!!! I love cherries…I wish I was the recipient of this set…very pretty! This is an amazing set! I too am lovin’ this stamp set and paper. There is just something about it….maybe because to me it screams summer!!! LOL! Don’t let it be the last of the cherries, this is just gorgeous! What an amazing job you did! Oh Sharon – these are unbelievable! Thank you for the inspiration! WOWZA!! This is so awesome!! Great job!!! 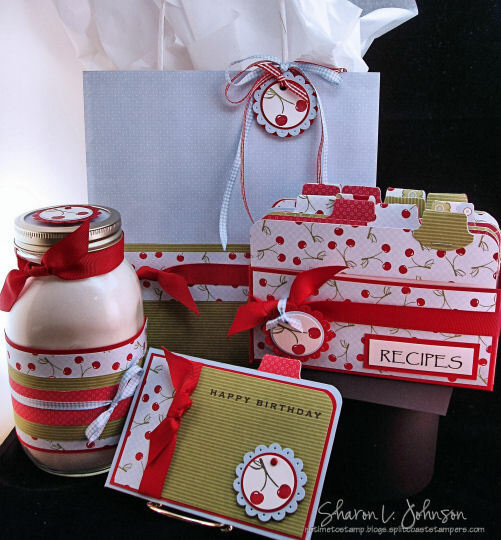 You are so good at creating these lovely and beautiful gift sets! You are my inspiration to try this! Please don’t stop sharing the cherries! I love this set and these papers. As always your ideas are breathtaking! I love that cherry paper. That reminds me of spring. This project is just over-the-top Sharon, I adore this ensemble. What a perfect gift set for a bridal shower! I love the cherries! In fact, your hostess set inspired me to make one of my own and post of my blog. I put a link to yours, because I do like yours better. Thanks for the inkspiration! Omgoodness! I love it when you do sets of stuff like this!!!! I like this one even more than the little boy set you made with “By Land” for SCS’s DD gallery. . . .so awesome, Sharon! This is so fun and fresh and beautiful! Love the whole gift set thing…you are the master of it! Love this..or rather these! OMG!!! This is such a darling set!!! I keep telling myself, I don’t need this set, but I’m LOVING it!!! I’m not tired of something as pretty as the cherry paper! I love the colors, the blue adds such a perfect touch. I also love that each item is very useful. You did a wonderful job on everything, TFS. I love your cherry set, Sharon! I had talked myself out of this set and now I’m not so sure. LOL. I’ve always loved your gift sets and this one is just so perfect as a kitchen gift! Every piece is wonderful. The paper is so cute! Very perky and fun! This is so darn cute. Thanks for sharing all the details with us! I love it! I may have to case your idea for a teacher gift! This is so darn cute! Thanks for sharing the details with us. I just love this idea! You are so creative. I may have to case your idea for a teacher gift. I love this set! I was wondering how you made the dividers? I made some from chipboard and I dont care for them. Thanks for your help in advance. Please don’t say it’s the last of the cherries!!! I LOVE that paper and the stamp set. I don’t know about you – but I’m going to order a ton of that paper before the end of May to make sure I have a stockpile in case it doesn’t make it to the next catty!!! Thanks for sharing your project!